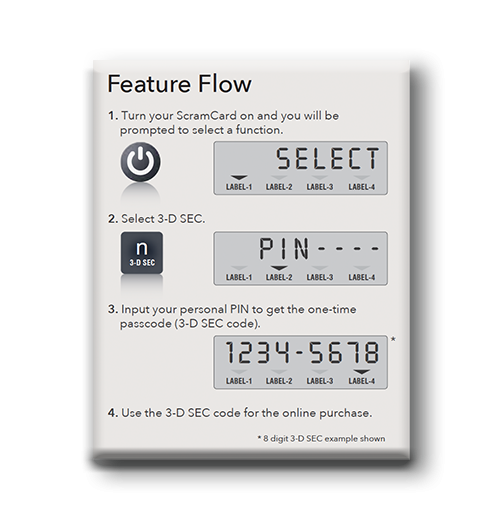 The features below represent authenticating inspired characteristics of the ScramCard device. Each feature delivers a method by which to address an identity related exposure that would otherwise exist without it, with a variety of capabilities able to extend across multiple business lines. 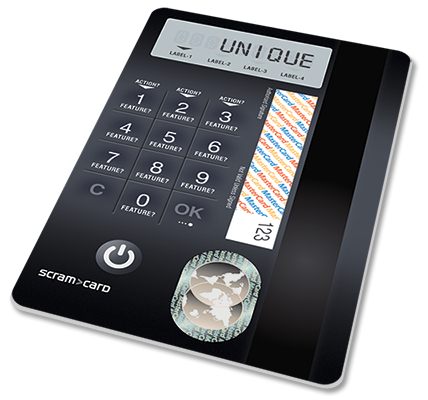 As a consequence, ScramCard can mitigate identity theft and dishonesty that currently exists during attempts to socially re-engineer, bypass online access methods and/or divert funds, all within a single product. 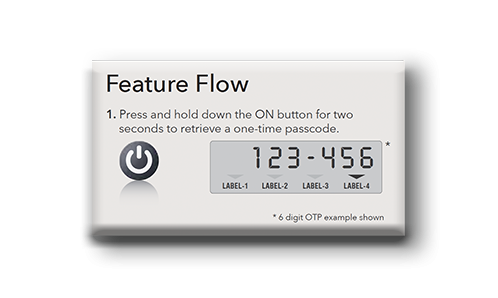 The OTP feature provides a useful means by which to ensure that a user can prove that they’re in possession of a physical ScramCard device. 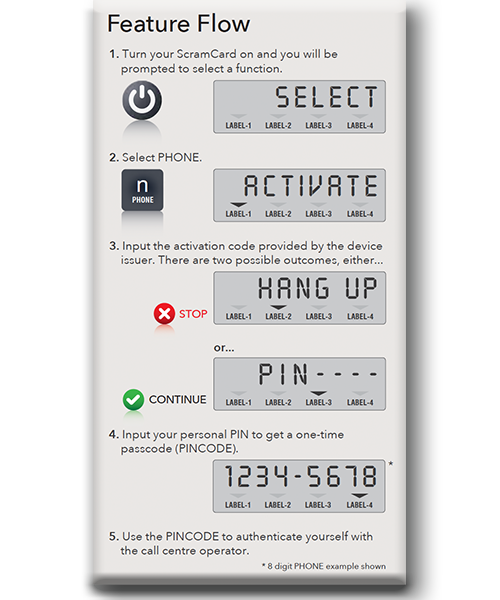 It also provides a simple transition from a weak static password to that of supporting dual factor authentication. 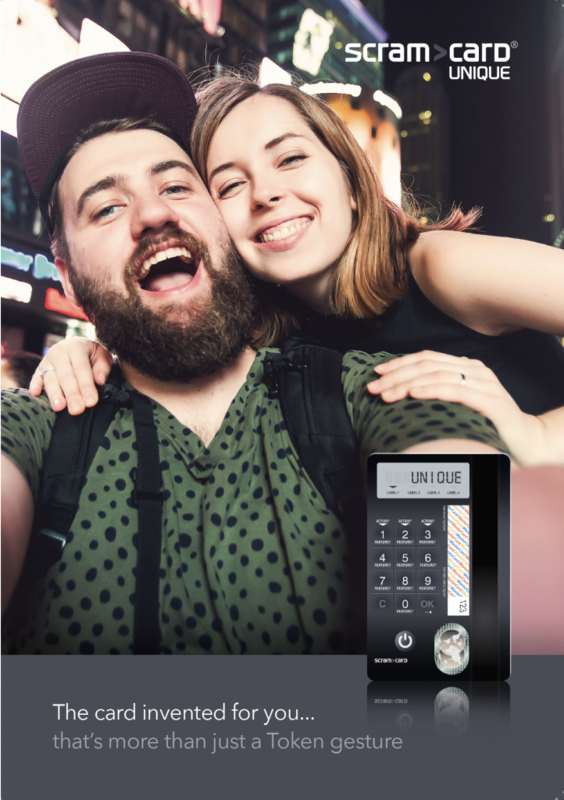 The inconvenience and non-appeal of today’s many cumbersome authentication devices are quickly addressed through the simplicity and robustness of PINCODE. 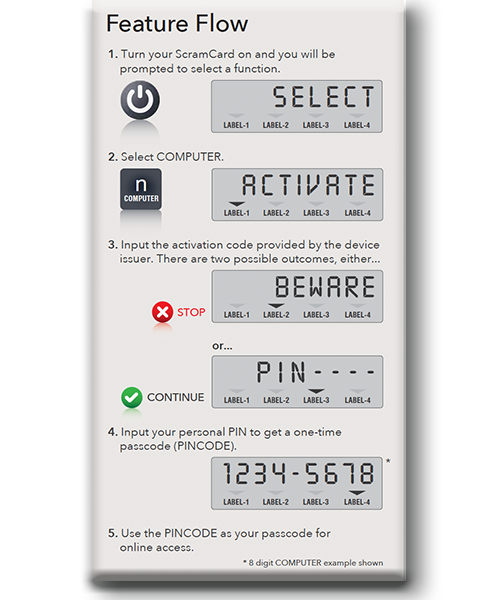 With the dynamic code generated with the PIN embedded within it, the need for an accompanying static password is also removed. 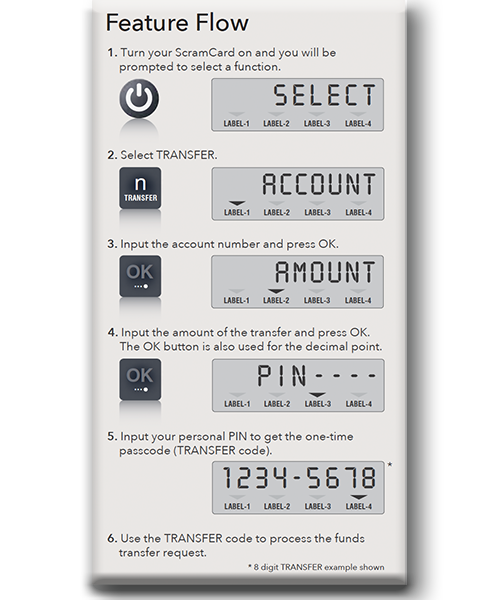 Appropriate authentication and non-repudiation of funds transfers requires the use of a digital signature to underpin the transfer. Meanwhile, the chance of this being adopted is commensurate with the likelihood of the consumer having the solution on them when the transfer needs to be done. The COMPUTER feature provides additional security for online access when the access is being attempted in an insecure location, such as an airport. A consumer can only generate a valid PINCODE on their ScramCard device if a unique code provided to them by the COMPUTER feature is able to activate their card. The PHONE feature provides a very effective mechanism by which to ensure that the user is only dealing with a legitimate service provider. 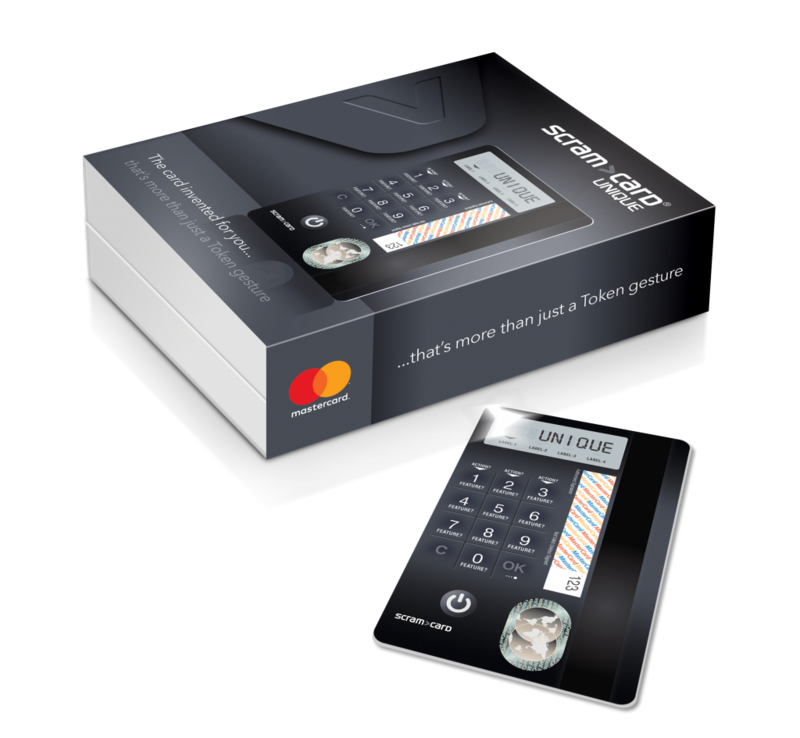 The feature warns of the disclosure of private information unless the service provider can supply a unique code capable of activating the ScramCard device. The widespread use of digital communication means the distribution of fraudulent, misleading and dangerous content represents a very real risk. 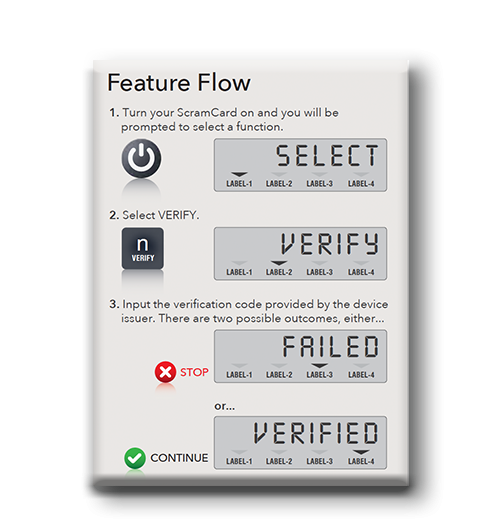 VERIFY allows provision of a unique dynamic code to enable the recipient to validate the integrity of the source of the communication. Abandoning of shopping carts because of long forgotten credentials can be easily rectified with ScramCard for the 3-D Secure payment protocol. The use of a dynamic 3-D Secure Code alleviates the need for consumers to have to remember a password or credentials they may have thought of long ago. If none of our four example propositions meet your requirements it is not to say that ScramCard isn’t for you. While each proposition is defined by its core capabilities, each card can be completely reconfigured, both in terms of the UNIQUE functional, financial and authentication based features they provide and the buttons against which each feature operates. Hence, nothing is fixed and the possibilities are literally endless for you to invent your own card proposition and go-to-market product.